This is actually too pretty to hang in the shower or scrub with. I can ‘see’ them hanging as ornaments in my craft room! What about Christmas tree ornaments? Annabelle gives us a basic free pattern, so pick some glitzy yarn (probably not suitable for the bath) and crochet away. You know I love dangly things. I could easily have 10 or more of these hanging around my crochet chair! Annabelle also offers completed ones for sale on her etsy page. Thanks for sharing, Annabelle. Wow. Thanks for posting my pattern and link! Love CraftGossip!!!!! 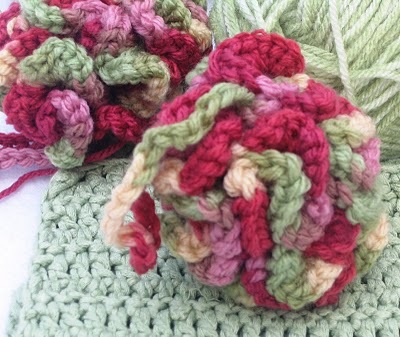 Those crocheted bath puffs are are so neat and colorful.